RAD51 is one of the key factors of DNA repair by homologous recombination and has been shown to have anti-apoptotic activity in tumor cells. RAD51 protein interacts with a variety of tumor suppressor proteins including p53, BRCA1 and BRCA2. Elevated expression of RAD51 enhances radio-resistance of human tumor cells. Overexpression of RAD51 protein in tumor cells renders them resistant against cytotoxic drugs like Cisplatin. RAD51 interacts with BRCA1 and BRCA2 to influence subcellular localization and cellular response to DNA damage. BRCA2 inactivation may be a key event leading to genomic instability and tumorigenesis from deregulation of RAD51. High-level expression of RAD51 has been observed in a variety of human malignancies. RAD51 overexpression correlates with histological grading of the tumor in invasive ductal mammary carcinoma. Small volumes of anti-RAD51 antibody vial(s) may occasionally become entrapped in the seal of the product vial during shipment and storage. If necessary, briefly centrifuge the vial on a tabletop centrifuge to dislodge any liquid in the container`s cap. Certain products may require to ship with dry ice and additional dry ice fee may apply. Immunohistology (Formalin-Fixed): 1-2ug/ml for 30 minutes at RT; Staining of formalin-fixed tissues is enhanced by boiling tissue sections in 10mM Citrate Buffer, pH 6.0, for 10-20 min followed by cooling at RT for 20 minutes. Formalin-fixed, paraffin-embedded human Colon Carcinoma stained with RAD51 Mouse Monoclonal Antibody (RAD51/2765). Analysis of Protein Array containing more than 19,000 full-length human proteins using RAD51 Mouse Monoclonal Antibody (RAD51/2765). Z- and S- Score: The Z-score represents the strength of a signal that a monoclonal antibody (MAb) (in combination with a fluorescently-tagged anti-IgG secondary antibody) produces when binding to a particular protein on the HuProtTM array. Z-scores are described in units of standard deviations (SD's) above the mean value of all signals generated on that array. If targets on HuProtTM are arranged in descending order of the Z-score, the S-score is the difference (also in units of SD's) between the Z-score. S-score therefore represents the relative target specificity of a MAb to its intended target. A MAb is considered to specific to its intended target, if the MAb has an S-score of at least 2.5. For example, if a MAb binds to protein X with a Z-score of 43 and to protein Y with a Z-score of 14, then the S-score for the binding of that MAb to protein X is equal to 29. NCBI/Uniprot data below describe general gene information for RAD51. It may not necessarily be applicable to this product. Plays an important role in homologous strand exchange, a key step in DNA repair through homologous recombination (HR) (PubMed:28575658). Binds to single and double-stranded DNA and exhibits DNA-dependent ATPase activity. Catalyzes the recognition of homology and strand exchange between homologous DNA partners to form a joint molecule between a processed DNA break and the repair template. Binds to single-stranded DNA in an ATP-dependent manner to form nucleoprotein filaments which are essential for the homology search and strand exchange (PubMed:26681308). 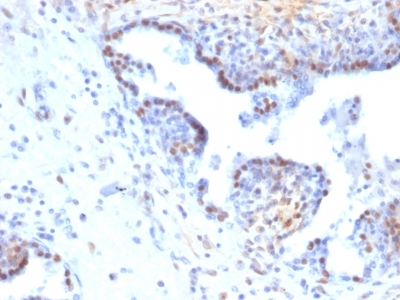 Part of a PALB2-scaffolded HR complex containing BRCA2 and RAD51C and which is thought to play a role in DNA repair by HR. Plays a role in regulating mitochondrial DNA copy number under conditions of oxidative stress in the presence of RAD51C and XRCC3. Also involved in interstrand cross-link repair (PubMed:26253028). 1. Data show that short ssDNA traverses the nuclear membrane, but is drawn into the nucleus by binding to the DNA replication and repair factors replication protein A (RPA) and Rad51 recombinase (Rad51).